How much have we missed our best striker? I remember when a certain Christian Obiozor joined us last season. He had just gotten in a tangle with Kano Pillars having been brought to Kano by his former gaffer Okey Emordi. His start with them was promising but from some misunderstanding, the union was over and he ran to Aba. You know all that part. The club got a clearance for him to play for us after week 9 and he was handed Rasheed Olabiyi’s number 12. His start with us was as promising as it promised before he joined. He formed a good partnership with Ifeanyi George and he did play sometimes with Peter Onyekachi and Nonso Okonkwo. It worked especially in some good away games. He was also quite handy at home. He would hold up play, bring other players into the game as well as having a go himself. Faultless from the spot, the Big, strong, hardworking Christian Obiozor is the ideal modern day striker. To me, he always looked a rookie Robert Lewandowski. Then came matchday 19 when we went to play his home club Rangers International in Enugu. Rangers have always had this thing with raising really big and decent strikers especially in recent times. (Osagona Ighodaro before him and now ex Heartland hitman Bobby Clement who inargubly is one of the best strikers in the land). In that game, Obiozor had a gash that meant Kadiri Ikhana withdrew him toward the closing stages with the game won. He had scored one before Bassey and Abalogu contributed to get our second after we had gotten them level via a penalty. 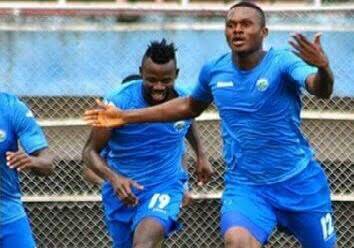 It was just the last game of the first half of the season last year, that was the last time he had adorned the Enyimba blue. The club made do with the strikers already on their books and a few others they signed like Musa Najere, Alloy Brown and Ahmed Kone but the most potent plug was a world class striker they plucked from the unknown – Some guy called Chinedu Udoji. He made a telling contribution which were match winners in three games. The burden to effectively replace Obiozor as well as nurse him back to fitness hadn’t quite turned out nicely. Quite a number of players have come but the travails of a troubled season have just affected the general output of the attack department of the team. For him there has of course been some false starts. Well, beyond just wanting the player to come back and feature for us is the worry on the fitness of the player. He’s been out for more than a year and we all were deeply concerned about him. There’s nothing more painful than for someone to be told that he cannot do what they love especially when this thing is also a source of income for them. The club stood by him, faithfully, which in all the things we accuse the club of doing, is a very good show of faith. Through the many different recovery and rehabilitation programs. Anyway, for the first time in over a year, Christian Obiozor has joined full training with the Enyimba first team and there are huge expectations that the striker may yet be able to make a contribution for us in the season’s title run in. Beyond just the later, the primary fact that this niggling injury can be put paid to is the greater joy. Just like when Mfon Udoh and Gambo Mohammed made recoveries from injuries last season. We may not be able to tell what could have been this past one year had he been around but we can be grateful that he is back and is on his way to full fitness. Not only for the club’s sake but for him and his own future too. 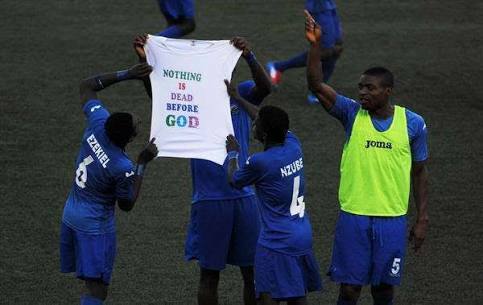 Indeed ‘nothing is dead before God’, Why? Because God gives life to things that are dead. We wish you all the very best Mr Obiozor. Previous postTrouble looms. Our season could be in jeopardy. Next postMy Shopping list for Heartland (Away).